1. 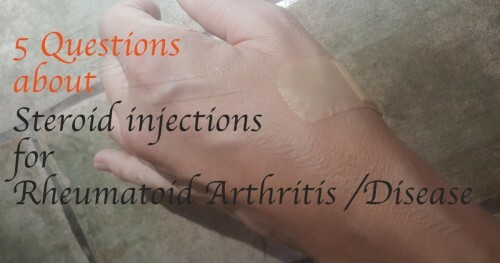 Why steroid injections for rheumatoid arthritis / disease? When joints are persistently inflamed, despite whatever therapies or systemic treatments are used, steroid injections for rheumatoid arthritis have been helpful for many people with rheumatoid disease / arthritis (PRD). For example, my wrist and back of hand joints have been swollen since I had to drive several hours last August, and my hands became more and more useless. I couldn’t hold tools like a hairbrush or a pen. Both thumbs have been angry (about what I’m not sure) for over a year. And a couple of trigger fingers on my dominant hand made it impossible to do most things. Not to mention the shoulders – unbearable. So over the past week, Dr. Personable injected joints on both hands, wrists and shoulders. We really appreciated what the he said about function being a priority. He said it’s important to deal with “all this synovitis and pain, but function is most important.” (Amazing. Usually, I try to convince doctors of this.) Not only is it more convenient if you can move around and do things, it’s better for you. Of course you keep your bones and muscles stronger if you can move around. 2. Why NOT use steroid injections for rheumatoid arthritis? Once, a previous doctor had voiced to us his disapproval for steroid injections for PRD: “This is not how to manage a systemic disease. You need to be controlled by treatment.” That is a nice thought. (And I’ll take that deal if I can get it!) I don’t mention it often on the blog because I don’t want to discourage anyone, but like many others, I haven’t experienced that treatment success. Unfortunately, only a minority of PRD has a “good” response to disease treatments. Dr. Personable said he understood why I’m worried about steroid side effects and cautious about how much medication I use, but not being able to move around is probably worse for my osteoporosis than occasional steroid shots. 3. What’s different about different clinicians? 4. “Why didn’t steroid injections work well for me?” some have asked. There are actually several cortisone derivatives that can be used in steroid injections for rheumatoid arthritis. I have seen at least four different medicines listed in my chart after various injections over the years. And they did work differently, so we asked Dr. Personable about that. He used Kenalog, and it worked well with an added systemic response I was very thankful for. 5. Should I get steroid injections for rheumatoid arthritis? As with every part of your treatment, you need to decide what treatments are best for you personally. As Dr. Personable pointed out, it’s always a balancing act with RA / RD. You have to balance risks and benefits with each treatment or intervention. What I can tell you is not to give up. It can be discouraging if something doesn’t work the first time or someone offers a negative opinion. But fighting RD is a long war, and you are a warrior. My DIP joints (near the fingertips) were affected early in the disease, but a doctor said it was impossible. Like most people with rheumatoid disease (PRD), I had no idea what the rules are for the disease. I was lucky to have contact with thousands of other PRD thanks to the internet and I started to analyze the evidence: “But not until I’d read some case studies and articles about Rheumatoid Arthritis in the DIP joint. Over the next couple of years, I looked for answers. I knew what my hands said. And I knew what other patients said. But, why would doctors try to tell us something different. How did it get so mixed up?” Continue reading Do DIP Joints Matter? Did your chest ever hurt sharply like you were being stabbed? Some PRD have gone to the emergency room because the pain was so severe. Others have been told it’s nonsense to say rheumatoid hurts in the chest… “Like many things in medicine, it is doubted or mocked by some because too little is known. And it is all too real to people living with inflammatory diseases that attack joints. Costochondritis is treated, like other joint inflammation, by rest, NSAIDs, ice or heat, and prednisone. Pain medications can help manage…” Continue reading Chest Pain in Rheumatoid Arthritis: Costochondritis Anyone? I never knew my thumbs could hurt this much. I know Karla. I’ve said that too. And about elbows and ribs and ankles too. I consider myself fortunate compared to many with RA, however I am intolerant of many medications including Methotrexate and Leflunomide given in the smallest doses possible. I have been treated with steroid injections Depomedrone intra muscular ie bum for more than 13th years. I have an injection every 3-5 months and manage relatively well in between with painkillers, massages and seeing a physio who has worked to release those really tight shoulder joints. Whilst I have thinning skin and a knock on a cupboard can tear it resulting in use of sterile strips to aid healing or in worse cases require Innadeen dressings I don’t regret the decision to have the injections and will continue to do so. I have no other adverse effects and stay fairly healthy without composing the immune system any further. My RA doc always tells me my body doesn’t react “right”. Perhaps my body didn’t read the same manual he did. I have good success with trigger point injections. Actually going to receive a bunch on the 29th. Glad yours have worked as well. I am going to ask about the medication this time when I have them done. Thank you for your excellent articles. It’s comforting to know there’s someone out there who relates. Thank you. Hi Kelley, seanons greetings! thank you so much for your work on this website. I’ve only been reading 30-40 minutes and have had so many questions answered. This is a very valuable resourse. My shoulder pain,makes me want to jump out of my skin. I turn to the steroid shot it saves me, for a minute! I had my first joint injection last month, I didn’t think that it hurt at all, but at that point my knee hurt so bad that I could barely walk. I had fantastic relief and I would not hesitate to get another, function is important. I too get chest pain at times, it seems if I move “wrong” my chest goes crazy and I can hardly move or breathe. Always a good time. There are times when a rheumatoid joint simply will not calm down without a steroid injection. A good rheumy will not over-inject. But when a joint used, especially in mobility, is not responding to oral or infused systemic meds, a long acting steroid injection is necessary, and not an evil. It is when that injection doesn’t last more than 4-6 weeks or less, and there is perpetual fluid on the joint to be drained off, that the doctor may want to xray that joint. It may be time for surgical intervention. When I was first diagnosed, my rheumatologist gave me a steroid injection. The steroid injection was not in any particular joint. He gave it to me in my arm to jump start relief in all my joints to hold me over until I could get my 1st round of meds filled and started. That has been the only steroid injection I’ve had.